2005-07-22 Assigned to MOLECULAR IMPRINTS, INC. reassignment MOLECULAR IMPRINTS, INC. ASSIGNMENT OF ASSIGNORS INTEREST (SEE DOCUMENT FOR DETAILS). Assignors: XU, FRANK Y. The present invention provides a method adhering a layer to a substrate that features defining first and second interfaces by having a composition present between the layer and the substrate that forms covalent bonds to the layer and adheres to the substrate employing one or more of covalent bonds, ionic bonds and Van der Waals forces. In this manner, the strength of the adhering force of the layer to the composition is assured to be stronger than the adhering force of the layer to the composition formed from a predetermined adhering mechanism, i.e., an adhering mechanism that does not include covalent bonding. The present application is a divisional of U.S. patent application Ser. No. ______ (Attorney Docket No. P235N226D226 filed herewith, entitled “Composition for Adhering Materials Together,” listing Frank Y. Xu as inventor, which is incorporated by reference herein. The field of invention relates generally to nano-fabrication of structures. More particularly, the present invention is directed to a method for adhering differing materials together suitable for use in imprint lithographic processes. Nano-scale fabrication involves the fabrication of very small structures, e.g., having features on the order of one nanometer or more. A promising process for use in nano-scale fabrication is known as imprint lithography. Exemplary imprint lithography processes are described in detail in numerous publications, such as United States published patent application 2004-0065976 filed as U.S. patent application Ser. No. 10/264,960, entitled “Method and a Mold to Arrange Features on a Substrate to Replicate Features having Minimal Dimensional Variability”; United States published patent application 2004-0065252 filed as U.S. patent application Ser. No. 10/264,926, entitled “Method of Forming a Layer on a Substrate to Facilitate Fabrication of Metrology Standards”; and United States published patent application 2004-0046271 filed as U.S. patent application Ser. No. 10/235,314, entitled “Method and a Mold to Arrange Features on a Substrate to Replicate Features having Minimal Dimensions Variability”; all of which are assigned to the assignee of the present invention. Referring to FIG. 1, the basic concept behind imprint lithography is forming a relief pattern on a substrate that may function as, inter alia, an etching mask so that a pattern may be formed into the substrate that corresponds to the relief pattern. A system 10 employed to form the relief pattern includes a stage 11 upon which a substrate 12 is supported, and a template 14 having a mold 16 with a patterning surface 18 thereon. Patterning surface 18 may be substantially smooth and/or planar, or may be patterned so that one or more recesses are formed therein. Template 14 is coupled to an imprint head 20 to facilitate movement of template 14. A fluid dispense system 22 is coupled to be selectively placed in fluid communication with substrate 12 so as to deposit polymerizable material 24 thereon. A source 26 of energy 28 is coupled to direct energy 28 along a path 30. Imprint head 20 and stage 11 are configured to arrange mold 16 and substrate 12, respectively, to be in superimposition, and disposed in path 30. Either imprint head 20, stage 11, or both vary a distance between mold 16 and substrate 12 to define a desired volume therebetween that is filled by polymerizable material 24. An important characteristic with accurately forming the pattern in the polymerizable material is to reduce, if not prevent, adhesion to the mold of the polymeric material, while ensuring suitable adhesion to the substrate. This is referred to as preferential release and adhesion properties. In this manner, the pattern recorded in the polymeric material is not distorted during separation of the mold. Prior art attempts to improve the release characteristics employ a release layer on the surface of the mold. The release layer is typically hydrophobic and/or has low surface energy. The release layer adheres to the mold. Providing the release layer improves release characteristics. This is seen by minimization of distortions in the pattern recorded into the polymeric material that are attributable to mold separation. This type of release layer is referred to, for purposes of the present discussion, as an a priori release layer, i.e., a release layer that is solidified to the mold. Another prior art attempt to improve release properties is described by Bender et al. in “Multiple Imprinting in UV-based Nanoimprint Lithography: Related Material Issues,” Microeletronic Engineering 61-62 (2002), pp. 407-413. Specifically, Bender et al. employ a mold having an a priori release layer in conjunction with a fluorine-treated UV curable material. To that end, a UV curable layer is applied to a substrate by spin-coating a 200 cPs UV curable fluid to form a UV curable layer. The UV curable layer is enriched with fluorine groups to improve the release properties. A need exists, therefore, to improve the preferential release and adhesion properties of a mold employed in imprint lithography processes. The present invention provides a method of adhering a layer to a substrate that features defining first and second interfaces by having a composition present between the layer and the substrate that forms covalent bonds to the layer and adheres to the substrate employing one or more of covalent bonds, ionic bonds and Van der Waals forces. In this manner, the strength of the adhering force of the layer to the composition is assured to be stronger than the adhering force of the layer to the composition having a predetermined adhering mechanism, i.e., an adhering mechanism that does not include covalent bonding. These and other embodiments are described herein. FIG. 11 is a plan view showing the chemical structure of a component of a composition that may be employed to form the primer layer shown in FIGS. 2, 3, and 7, in accordance with a fourth embodiment of the present invention. Referring to FIGS. 1 and 2, a mold 36, in accordance with the present invention, may be employed in system 10, and may define a surface having a substantially smooth or planar profile (not shown). Alternatively, mold 36 may include features defined by a plurality of spaced-apart recessions 38 and protrusions 40. The plurality of features defines an original pattern that forms the basis of a pattern to be formed on a substrate 42. Substrate 42 may comprise a bare wafer or a wafer with one or more layers disposed thereon, one of which is shown as primer layer 45. To that end, reduced is a distance “d” between mold 36 and substrate 42. In this manner, the features on mold 36 may be imprinted into a conformable region of substrate 42, such as an imprinting material disposed on a portion of surface 44 that presents a substantially planar profile. It should be understood that the imprinting material may be deposited using any known technique, e.g., spin-coating, dip coating and the like. In the present example, however, the imprinting material is deposited as a plurality of spaced-apart discrete droplets 46 on substrate 42. Imprinting material is formed from a composition that may be selectively polymerized and cross-linked to record the original pattern therein, defining a recorded pattern. Specifically, the pattern recorded in the imprinting material is produced, in part, by interaction with mold 36, e.g., electrical interaction, magnetic interaction, thermal interaction, mechanical interaction or the like. In the present example, mold 36 comes into mechanical contact with the imprinting material, spreading droplets 36, so as to generate a contiguous formation 50 of the imprinting material over surface 44. In one embodiment, distance “d” is reduced to allow sub-portions 52 of imprinting material to ingress into and fill recessions 38. To facilitate filling of recessions 38, before contact between mold 36 and droplets 46, the atmosphere between mold 36 and droplets 46 is saturated with helium or is completely evacuated or is a partially evacuated atmosphere of helium. The imprinting material is provided with the requisite properties to completely fill recessions 38 while covering surface 44 with a contiguous formation of the imprinting material. In the present embodiment, sub-portions 54 of imprinting material in superimposition with protrusions 40 remain after the desired, usually minimum, distance “d” has been reached. This action provides formation 50 with sub-portions 52 having a thickness t1, and sub-portions 54, having a thickness t2. Thicknesses “t1” and “t2” may be any thickness desired, dependent upon the application. Thereafter, formation 50 is solidified by exposing the same to the appropriate curing agent, e.g., actinic energy, such as broadband ultra violet energy, thermal energy or the like, depending upon the imprinting material. This causes the imprinting material to polymerize and cross-link. The entire process may occur at ambient temperatures and pressures, or in an environmentally-controlled chamber with desired temperatures and pressures. In this manner, formation 50 is solidified to provide side 56 thereof with a shape conforming to a shape of a surface 58 of mold 36. Referring to FIGS. 1, 2 and 3, the characteristics of the imprinting material are important to efficiently pattern substrate 42 in light of the unique patterning process employed. For example, it is desired that the imprinting material have certain characteristics to facilitate rapid and even filling of the features of mold 36 so that all thicknesses t1 are substantially uniform and all thicknesses t2 are substantially uniform. To that end, it is desirable that the viscosity of the imprinting material be established, based upon the deposition process employed, to achieve the aforementioned characteristics. As mentioned above, the imprinting material may be deposited on substrate 42 employing various techniques. Were the imprinting material deposited as a plurality of discrete and spaced-apart droplets 46, it would be desirable that a composition from which the imprinting material is formed have relatively low viscosity, e.g., in a range of 0.5 to 20 centipoises (cPs). Considering that the imprinting material is spread and patterned concurrently, with the pattern being subsequently solidified into formation 50 by exposure to radiation, it would be desired to have the composition wet surface of substrate 42 and/or mold 36 and to avoid subsequent pit or hole formation after polymerization. Were the imprinting material deposited employing spin-coating techniques, it would be desired to use higher viscosity materials, e.g., having a viscosity greater than 10 cPs and typically, several hundred to several thousand cPs, with the viscosity measurement being determined in the absence of a solvent. In addition to the aforementioned characteristics, referred to as liquid phase characteristics, it is desirable that the composition provides the imprinting material with certain solidified phase characteristics. For example, after solidification of formation 50, it is desirable that preferential adhesion and release characteristics be demonstrated by the imprinting material. Specifically, it is beneficial for the composition from which the imprinting material is fabricated to provide formation 50 with preferential adhesion to substrate 42 and preferential release of mold 36. In this fashion, reduced is the probability of distortions in the recorded pattern resulting from the separation of mold 36 therefrom due to, inter alia, tearing, stretching or other structural degradation of formation 50. The constituent components of the composition that form the imprinting material to provide the aforementioned characteristics may differ. This results from substrate 42 being formed from a number of different materials. As a result, the chemical composition of surface 44 varies dependent upon the material from which substrate 42 is formed. For example, substrate 42 may be formed from silicon, plastics, gallium arsenide, mercury telluride, and composites thereof. As mentioned above, substrate 42 may include one or more layers shown as primer layer 45, e.g., dielectric layer, metal layer, semiconductor layer, planarization layer and the like, upon which formation 50 is generated. To that end, primer layer 45 would be deposited upon a wafer 47 employing any suitable technique, such as chemical vapor deposition, spin-coating and the like. Additionally, primer layer 45 may be formed from any suitable material, such as silicon, germanium and the like. Additionally, mold 36 may be formed from several materials, e.g., fused-silica, quartz, indium tin oxide diamond-like carbon, MoSi, sol-gels and the like. It has been found that the composition from which formation 50 is generated may be fabricated from several different families of bulk materials. For example, the composition may be fabricated from vinyl ethers, methacrylates, epoxies, thiol-enes and acrylates, just to name a few. and comprises approximately 47% of bulk material by weight, but may be present in a range of 20% to 80%, inclusive. As a result, the mechanical properties of formation 50 are primarily attributable to IBOA. An exemplary source for IBOA is Sartomer Company, Inc. of Exton, Pa. available under the product name SR 506.
and comprises approximately 25% of bulk material by weight, but may be present in a range of 0% to 50%, inclusive. Also providing flexibility to formation 50, n-HA is employed to reduce the viscosity of the prior art bulk material so that bulk material, in the liquid phase, has a viscosity in a range 2-9 Centipoises, inclusive. An exemplary source for the n-HA component is the Aldrich Chemical Company of Milwaukee, Wis.
and comprises approximately 25% of bulk material by weight, and may be present in a range of 10% to 50%, inclusive. EGDA also contributes to the modulus and stiffness buildup, as well as facilitates cross-linking of n-HA and IBOA during polymerization of the bulk material. and comprises approximately 3% of the bulk material by weight, and may be present in a range of 1% to 5%, inclusive. The actinic energy to which the initiator is responsive is broad band ultra-violet energy generated by a medium-pressure mercury lamp. In this manner, the initiator facilitates cross-linking and polymerization of the components of the bulk material. It has been disclosed, however, in co-pending U.S. patent application Ser. No. 11/068,171, filed Feb. 28, 2005, entitled “Composition to Reduce Adhesion Between a Conformable Region and a Mold,” having Frank Xu and Michael N. Miller listed as inventors, that desirable preferential adhesion and release properties, as discussed above, may be achieved by producing a weak boundary layer, lamella 60, between mold 36, surface 58 and formation 50, shown in FIGS. 3 and 4. Lamella 60 remains after solidification of the imprinting material. As a result, the adhesion forced between mold 36 and formation 50 are minimal. To that end, found beneficial was employing a composition for the imprinting material that includes one of several compositions, such as the BULK IMPRINTING MATERIAL discussed above, along with a component that contains low surface energy groups, referred to as a surfactant component and fully described in U.S. patent application Ser. No. 11/068,171, filed Feb. 28, 2005, entitled “Composition to Reduce Adhesion Between a Conformable Region and a Mold,” having Frank Xu and Michael N. Miller listed as inventors, which is incorporated by reference herein. Referring to FIG. 5, after deposition of the imprinting material, the surfactant component rises, after a period of time, to the air liquid interface, providing droplets 146 of imprinting material with a bifurcated concentration of materials. In a first portion, droplets 146 include a higher concentration of the surfactant component, referred to as a surfactant-component-rich (SCR) sub-portion 136, than the second portion, referred to as a surfactant-component-depleted (SCD) sub-portion 137. SCD sub-portion 137 is positioned between surface 44 and SCR sub-portion 136. SCR sub-portion 136 attenuates the adhesion forces between mold 36 and the imprinting material, once the imprinting material is solidified. Specifically, the surfactant component has opposed ends. When the imprinting material is in the liquid phase, i.e., polymerizable, one of the opposed ends has an affinity for the bulk material included in the imprinting material. The remaining end has a fluorine component. Referring to FIGS. 4 and 5, as a result of the affinity for the bulk material, the surfactant component is orientated so that the fluorine component extends from an air-liquid interface defined by the imprinting material and the surrounding ambient. Upon solidification of the imprinting material, a first portion of the imprinting material generates a lamella 60 and a second portion of the imprinting material is solidified, i.e., polymeric material shown as formation 50. Lamella 60 is positioned between formation 50 and mold 36. Lamella 60 results from the presence and location of the fluorine components in the SCR sub-portion 136. Lamella 60 prevents strong adhesion forces from being developed between mold 36 and formation 50. Specifically, formation 50 has first and second opposed sides 62 and 64. Side 62 adheres to mold 36 with a first adhesion force. Side 64 adheres to substrate 42 with a second adhesion force. Lamella 60 results in the first adhesion force being less than the second adhesion force. As a result, mold 36 may be easily removed from formation 50 while minimizing distortions and/or the force required to separate mold 36 therefrom. Although formation 50 is shown with side 62 being patterned, it should be understood that side 62 may be smooth, if not planar. Furthermore, if desired, it is possible to generate lamella 60 so as to be disposed between formation 50 and substrate 42. This may be achieved, for example, by applying imprinting material to mold 36 and subsequently contacting substrate 42 with the imprinting material on mold 36. In this manner, it can be said that formation 50 will be disposed between lamella 60 and the body, e.g., mold 36 or substrate 42, upon which the polymerizable material is deposited. It should be understood that were the imprinting material deposited employing spin-coating techniques, similar bifurcated concentration of materials occurs, as shown in FIG. 6 with respect to SCR sub-portion 236 and second and SCD sub-portion 237. The time required for the bifurcation is dependent upon several factors, including the size of molecules in the composition and the viscosity of the composition. Only a few seconds is needed to achieve the aforementioned bifurcation of composition with viscosity below twenty cPs. Material with viscosity in the hundreds of cPs, however, may require a few seconds to several minutes. It has been discovered, however, that lamella 60 may not be uniform. Some regions of lamella 60 are thinner than others, and in some extreme cases, lamella 60 may be absent in an extremely small percentage of the template surface so that template 36 is in contact with formation 50. As a result of the thinner regions of lamella 60 and in the absence of lamella 60, distortion and/or delamination of formation 50 from substrate 42 may occur. Specifically, upon separation of mold 36, formation 50 is subjected to a separation force Fs. Separation force Fs is attributable to a pulling force Fp. on mold 36 and adhering forces, e.g., Van der Waals forces, between formation 50 and mold 36 as reduced by lamella 60. Due to the presence of lamella 60 separation force Fs typically has a magnitude that is less than the magnitude of an adhering force FA between formation 50 and substrate 42. However, with the reduction, or absence, of lamella 60, local separation force Fs may approach the magnitude of local adhering force FA. By local forces what is meant are the forces present in a given region of lamella layer 60, which in this example are the local forces proximate to a thin region of lamella layer 60 or where lamella layer 60 is substantially absent. This leads to distortion and/or delamination of formation 50 from substrate 42. Referring to FIG. 7, in the presence of primer layer 45, a more complex situation exists due to the presence of two interfaces 66 and 68. At a first interface 66 a first adhering force F1 is present between primer layer 45 and formation 50. At a second interface 68 a second adhering force, F2, is present between primer layer 45 and wafer 47. It is desired that the separation force Fs have a magnitude that is less than either adhering forces F1 and F2. However, due to variations in the thickness, or absence, of lamella 60, as discussed above, separation force Fs may be similar or approach the magnitude of one or both of adhering forces F1 and F2. This may cause delamination of formation 50 from primer layer 45, primer layer 45 from wafer 47 or both. The present invention reduces, if not avoids, the delamination problem mentioned above by forming primer layer 45 from a material that increases the probability that first F1 and second F2 adhering forces of the first and second interface, respectively, are greater than the separation force Fs in view of lamella layer fluctuations. To that end, primer layer 45 is formed from a composition that forms strong bonds at interface 66, i.e., between primer layer 45 and formation 50, as well as, i.e., between interface 66, primer layer 45 and wafer 47. In the present example, adhesion between primer layer 45 and formation 50 at first interface 66 is the result of covalent bonding, i.e., covalent bonds between the composition from which primer layer 45 is formed and the composition from which formation 50 is formed are present. Adhesion between primer layer 45 and wafer 47 may be achieved through any one of various mechanisms. These mechanisms may include covalent bonds formed between the composition from which primer layer 45 is formed and the material from which wafer 47 is formed. Alternatively, or in addition to, the covalent bonds, ionic bonds may be formed between the composition from which primer layer 45 is formed and the material from which wafer 47 is formed. Alternatively, or in addition to, the covalent bonds, and/or the ionic bonds or both, adhesion between the composition from which primer layer 45 is formed and the material from which wafer 47 is formed may be achieved vis-à-vis Van der Waals forces. In which R, R′, R″ and R′″ are linking groups and x, y, z are averaged repeating numbers of the groups associated therewith. These repeating units could be randomly distributed. The groups X and X′ denote the functional groups, with the understanding that typically, the functional group X differs from functional group X′. One of the functional groups X and X′, for example X′, is selected to achieve cross-reaction with the material from which substrate 42 is formed to adhere thereto by forming a covalent bond therewith, ionic bond therewith and/or Van der Waals forces. One of the remaining functional groups X and X′, for example X, is selected to achieve cross-reaction with the material from which formation 50 is formed to form a covalent bond therebetween. The functionality of the X group is established so the cross-reaction occurs during polymerization of formation 50. As a result, the selection of functional group X depends upon the characteristics of the material from which formation 50 is formed, it is desired that functional group X reacts with the functional groups of the composition from which formation 50 is formed. For example, were formation 50 formed from acrylate monomers, X may be comprised of acrylic, vinyl ether, and or alkoxyl functional groups, and/or functional groups that can copolymerize with acrylic groups in formation 50. As a result, X functional groups cross-react in response to ultraviolet actinic energy. Functional groups X′ may also participate in the cross-linking and polymerization reactions of primer layer 45. Typically, X′ functional groups facilitate polymerization and cross-linking in response to an actinic energy that differs from the actinic energy in response to which X functional groups cross-react. The X′ functional groups in the present example facilitate cross-linking of molecules in primer layer 45 in response to exposure to thermal energy. Typically, functional groups X′ are selected to facilitate cross-reaction with substrate 42 through three mechanisms: 1) direct reaction with material from which substrate 42 is formed; 2) reaction with cross-linker molecules with a linking functional group of the cross-linker reacting with substrate 42; and 3) polymerization of and cross-linking of primer layer 45 so that chains of molecules of sufficient length may be developed to connected between formation 50 and substrate 42. The X′ functional group 70 provides carboxylic functionality. The X functional group 72 provides acrylate functionality. Functional groups 70 and 72 are coupled to opposing ends of a backbone component 74. 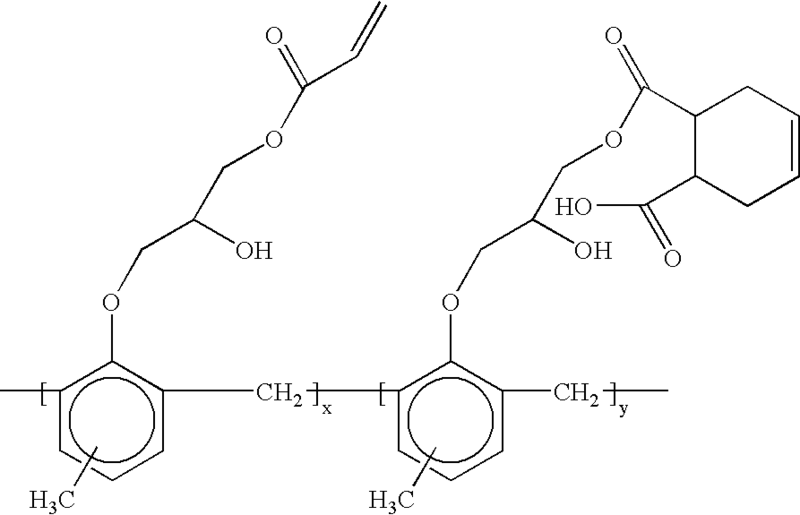 The X′ functional group 76 provides epoxy functionality. The X functional group 78 provides acrylate functionality. Functional groups 76 and 78 are coupled to opposing ends of a backbone component 80.
where x and y are integers indicating repeating units that are randomly distributed. The X′ functional group 82 provides carboxylic functionality. The X functional group 84 provides acrylate functionality. Functional groups 82 and 84 are coupled to opposing ends of a backbone component 86. The X′ functional group 90 provides hydroxyl functionality. The X functional group 92 provides initiator-type functionality. Specifically, in response to exposure to broad band ultraviolet energy the functional group X undergoes alpha-cleavage to generate benzoyl type of radicals. The radicals facilitate radical polymerization of the composition from which formation 50 is formed. Functional groups 90 and 92 are coupled to opposing ends of a backbone component 94. Approximately 100 grams of COMPOSITION 2 comprises DUV30J-16, 0.611 gram of COMPOSITION 2 comprises IsoRad 501, 0.175 gram of COMPOSITION 2 comprises Cymel 303ULF and 0.008 gram of COMPOSITION 2 comprises Cycat 4040. PM Acetate Composition 3 includes approximately 77 grams of IsoRad 501, 22 grams of Cymel 303ULF and one gram of Cycat 4040. IsoRad 501, Cymel 303ULF and Cycat are combined. The combination of IsoRad 501, Cymel 303ULF and Cycat are then introduced into approximately 1900 grams of PM Acetate. 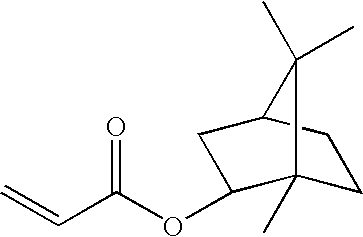 PM Acetate is a product name of a solvent consisting of 2-(1-Methoxy)propyl acetate sold by Eastman Chemical Company of Kingsport, Tenn.
A fourth composition is identical to COMPOSITION 3, excepting for the amount of the constituent components included. For example, COMPOSITION 4 includes approximately 85.2 grams of IsoRad 501, 13.8 grams of Cymel 303ULF and one gram of Cycat 4040. IsoRad 501, Cymel 303ULF and Cycat are combined. The combination of IsoRad 501, Cymel 303ULF and Cycat are then introduced into approximately 1900 grams of PM Acetate. A fifth composition is identical to COMPOSITION 3, excepting for the amount of the constituent components included. For example, COMPOSITION 5 includes approximately 81 grams of IsoRad 501, 18 grams of Cymel 303ULF and one gram of Cycat 4040. IsoRad 501, Cymel 303ULF and Cycat are combined. The combination of IsoRad 501, Cymel 303ULF and Cycat are then introduced into approximately 1900 grams of PM Acetate. Each of the five compositions discussed above with respect to primer layer 45, , COMPOSITIONs 1-5, are deposited upon substrate 42 employing spin-coating techniques wherein the substrate is rotated at a velocity between 500 and 4,000 revolutions per minute so as to provide a substantially smooth, if not planar layer with uniform thickness. This is followed by exposing the compositions to thermal actinic energy of 180° C. (Celsius) for approximately two minutes. The five compositions described above, COMPOSITIONs 1-5, were employed, along with IMPRINTING MATERIAL, to generate comparative data of the strength of the adhesion forces of interfaces 66 and 68 which was compared against baseline measuring of a primer layer 45 formed entirely from DUV30J-16, which is not known to form covalent bonds with formation 50 formed from IMPRINTING MATERIAL. To that end, formation 50, formed from BULK IMPRINTING MATERIAL, and primer layer 45, formed from COMPOSITIONS 1-5 and the base line COMPOSITION, were deposited and then solidified between two glass slides (not shown). Each glass slide (not shown) is approximately 1 mm thick, 75×25 mm in the lateral dimension. Before deposition of primer layer 45 and formation 50 the glass slides (not shown) are cleaned. Specifically each glass slide (not shown) is exposed to Piranha solution (H2SO4: H2O2=2.5:1 by volume). The glass slides (not shown) are subsequently rinsed with de-ionized water, sprayed with isopropyl alcohol, and exposed to a stream of fluid for drying, e.g., a stream of nitrogen gas. Thereafter, the glass slides (not shown) are baked at 120° C. (Celsius) for 2 hours. Primer layer 45 is deposited onto each of the two glass slides (not shown) employing spin-on techniques with a spin speed up to 3000 rpm. Primer layer 45 is lying on the glass slides (not shown) on hot plates at 180C. for 2 minutes. In other words, each of COMPOSITIONs 1-5, as well as the baseline composition are solidified, i.e., polymerized and cross-linked, by exposure to thermal energy. Formation is formed employing drop dispense techniques mentioned above. Specifically, BULK IMPRINTING MATERIAL is disposed as a plurality of droplets onto primer layer 45 on one of the two glass slides. The BULK IMPRINTING MATERIAL is then sandwiched between two primer layers 45 by having the primer layer on the two glass slides (not shown) facing one another and contacting BULK IMPRINTING MATERIAL. Typically a longitudinal axis of one of the two glass slides (not shown) extends orthogonally to the longitudinal axis of the remaining glass slide (not shown). The BULK IMPRINTING MATERIAL is solidified, i.e., polymerized, and cross-linked by exposing the two glass slides (not shown) to actinic energy, such as broad band ultraviolet wavelengths, using a medium pressure mercury UV lamp for 40 seconds at 20 mW/cm2 intensity. To measure the strength of the adhesion, a four-point bending fixture (not shown) was adopted for the adhesion test and technique, similar to that described in “Measurement of Adhesive Force Between Mold and Photocurable Resin in Imprint Technology” Japanese Journal of Applied Physics, Vol. 41 (2002) pp. 4194-4197. The maximum force/load was taken as the adhesion value. The beam distance of the top and bottom two points is 60 mm. The load was applied at the speed of 0.5 mm per minute. Employing this test, it was determined that delamination occurred at 6.1 pounds of force when primer layer 45 was formed with the baseline composition. A separation force of approximately 6.5 pounds was reached before delamination occurred with primer layer 45 being formed from COMPOSITION 1. A separation force of approximately 9.1 pounds was reached before delamination occurred with primer layer 45 being formed from COMPOSITION 2. When primer layer 45 was formed from each of COMPOSITIONs 3, 4 or 5, one or both of the two glass slides (not shown) failed (broke) before delamination occurred. As a result, forces of up to 11 pounds were measured without delamination being observed. As a result, it is observed that COMPOSITIONs 3, 4 and 5 provide primer layer 45 with superior operational characteristics in that it effectively prevents delamination were lamella layer 60 to have undesirably thin regions or be altogether absent. The embodiments of the present invention described above are exemplary. Many changes and modifications may be made to the disclosure recited above while remaining within the scope of the invention. For example, the solvent PM Acetate is employed primarily to dissolve the other constituent components of COMPOSITIONs 3, 4 and 5. As a result, many common photo-resist solvents may be employed in lieu of PM Acetate, such as Diethylene Glycol Monoethyl Ether Acetate, Methyl Amyl Ketone or the like. Further, the solid contents of COMPOSITIONs 3, 4 and 5, i.e., IsoRad 501, Cymel 303ULF and Cycat may comprise between 0.1% to 70% of the composition, weight, and more preferably in a range of 0.5% to 10% by weight, with the remaining quantity consisting of the solvent. The solid component of each of COMPOSITIONs 3, 4, and 5 may comprise 50% to 99%, by weight of IsoRad 501, 1% to 50%, by weight of Cymel 303ULF and 0% to 10% by weight of Cycat 4040. The scope of the invention should not, therefore, be limited by the above description, but instead should be determined with reference to the appended claims along with their full scope of equivalents. defining first and second interfaces by having a composition present between said layer and said substrate, with said first interface being defined between said layer and said composition and said second interface being defined between said substrate and said composition, with said first interface including covalent bonds and said second interface including a mechanism adhering said composition to said substrate. 2. The method as recited in claim 1 wherein said mechanism is selected from a set of mechanisms including covalent bonds, ionic bonds and Van der Waals forces. 3. The method as recited in claim 1 wherein said second interface is formed by thermally curing said composition and said first interface is formed by exposing said layer and said composition to actinic energy. 4. The method as recited in claim 1 wherein defining further includes solidifying said composition, defining a solidified composition and forming said layer upon said solidified composition. 5. The method as recited in claim 1 wherein defining further includes locating, between said layer and said substrate, a plurality of molecules, a subset of which includes an organic backbone group and first and second functional groups with said first functional group reacting with said layer to form said covalent bonds and said second functional group reacting with said substrate. 6. The method as recited in claim 1 wherein defining further includes locating between said layer and said substrate a plurality of molecules, a first subset of which is a cross-linker and a second subset of which includes a backbone group and first and second functional groups with said first functional group reacting with said layer forming said covalent bonds and said second functional group reacting with one of said substrate and said cross-linker. 7. The method as recited in claim 6 wherein said backbone group contains aromatic structures. 8. The method as recited in claim 1 wherein defining further includes locating between said layer and said substrate a plurality of molecules, a subset of which includes a backbone group and first and second functional groups with said first functional group consisting essentially of an acrylate functional group reacting with said layer to form said covalent bonds. 9. The method as recited in claim 8 wherein said backbone group is selected from a set of groups consisting essentially of aliphatic and aromatic. forming said layer upon said solidified composition, with a first interface being defined between said layer and said solidified composition and a second interface being defined between said substrate and said composition, with said first interface including covalent bonds and said second interface including a mechanism adhering said composition to said substrate with said mechanism being selected from a set of mechanisms bonds consisting essentially of covalent bonds, ionic bonds and Van der Waals forces. 11. The method as recited in claim 10 wherein said second interface is formed by thermally curing said composition and said first interface is formed by exposing said layer and said composition to actinic energy. 12. The method as recited in claim 10 wherein depositing further includes locating upon said substrate a plurality of molecules, a subset of which includes an organic backbone group and first and second functional groups, with said second functional group reacting with said substrate, with forming further including reacting said first functional group with said layer to form said covalent bonds of said first interface. 13. The method as recited in claim 10 wherein depositing further includes locating upon said substrate a plurality of molecules, a first subset of which is a cross-linker and a second subset of which includes a backbone group and first and second functional groups with said second functional group reacting with one of said substrate and said cross-linker, with forming further including reacting said first functional group with said layer to form said covalent bonds of said first interface. 14. The method as recited in claim 10 wherein depositing further includes locating between said layer and said substrate a plurality of molecules, a subset of which includes a backbone group and first and second functional groups with said first functional group consisting essentially of an acrylate functional group, with forming further including reacting said first function group with said layer to form said covalent bonds of said first interface. 15. The method as recited in claim 14 wherein said backbone group is selected from a set of groups consisting essentially of aliphatic and aromatic. arranging said layer and said substrate so as to have a composition disposed therebetween to create first and second adhering forces, with said first adhering force being generated at a first interface of said layer and said composition and said second adhering force being disposed at a second interface of said composition with said substrate, said first adhering force and second adhering force being greater than the non-covalent bonded first adhering force. 17. The method as recited in claim 16 wherein said first and second adhering forces are greater than a separation force. 18. The method as recited in claim 16 wherein said first adhering force is generated by covalently bonding said composition to said layer and said second adhering force is generated by adhering said composition to said substrate employing a mechanism selected from a set of mechanisms including covalent bonds, ionic bonds and Van der Waals forces. 19. The method as recited in claim 16 wherein said second interface is formed by thermally curing said composition and said first interface is formed by exposing said layer and said composition to actinic energy. 20. The method as recited in claim 16 wherein defining further includes solidifying said composition, defining a solidified composition and forming said layer upon said solidified composition. WO2018159576A1 (en) * 2017-02-28 2018-09-07 富士フイルム株式会社 Primer layer-forming composition, kit, primer layer, and laminate.